"Hardly the metaphysical ideas are independent from the roots of their complex, and can therefore be outbreaks of disease, part of a 'syndrome archetypal'. For example, the materialism of certain natural science is perhaps not a philosophy of matriarchy in which the scientist, who want it or not,becomes a heroic son or priesthood? Vedanta with its transcendence of the matter does not reflect so perhaps a spirit trapped in the Great Mother of the world from having to rely on disciplined exercises to find liberation? In our metaphysics we declare our fantasies about the physical and its transcendence. A metaphysical statement can be seen as a fancy psychological fancy about the relationship between 'matter and spirit'. [...] The archetypal neuros is collective and affects all with the metaphysical affliction. Processing this affliction is individual, and this makes therapy a metaphysical commitment in which not only complexes but also feelings and ideas undergo to a process and a change ". - James Hillman, The great mother, her son, her hero and the puer. For decades researchers have attempted to describe the ground state of being in terms of quantum mind. The preferred pop term for the virtual vacuum has switched from scalar and zero point to torsion field, which has been correlated with Consciousness – the Holy Grail of the Quantum Quest. The torsion field is produced by the spin of virtual vacuum photons, which may be the energetic field underlying collective [entangled] and individual mind. This groundstate has "never been", yet is continuously emerging and may provide deeper insight into the transduction of collective or universal being to individual consciousness and experience. The collected inertia in a certain area of space from a spinning electromagnetic field creates observable mass. "It is by avoiding the rapid decay into the inert state of `equilibrium' that an organism appears so enigmatic....What an organism feeds upon is negative entropy." --Schrödinger's, What is Life? Beyond such critique, master narratives also offer a fruitful avenue to investigate dynamics involved in, and issuing from materializing cultural alterity in their framework. with other forms of collective identity. If consciousness emerges into ontological reality at some point in nature, as system complexity increases, then it also ‘submerges’ at some adjoining point, as structures simplify. This has led some to posit a ‘latent-consciousness’ in what Bohr saw as the consciousness-like spontaneity of quantum phenomena. Yet to move on this basis to Whitehead’s ontological pan-experientialism or to direct quantum explanations of consciousness (Hameroff and Penrose) faces serious epistemological limitations — perhaps being more unwittingly projective than genuinely explanatory. More reasonable would be an epistemological pan- experientialism in the sense of the later James. 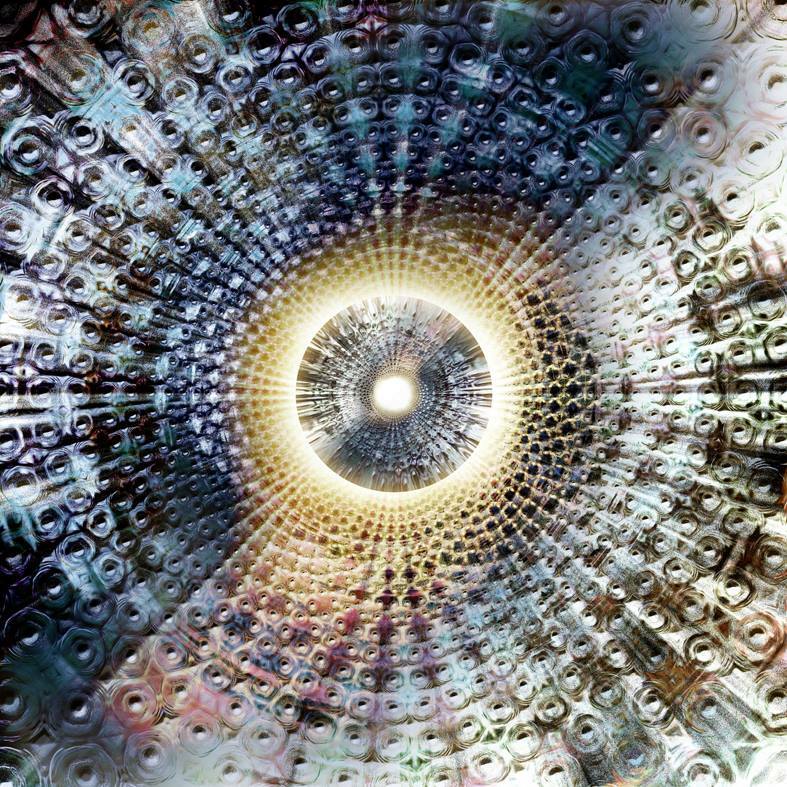 Consciousness, as the ultimate lens and medium of all knowledge, is inseparable from the physical reality it would know, especially at the very limits of empirical observation in microphysics. ‘Submerged’ consciousness is better understood in Jamesian pragmatic terms than via assumed but unprovable ontologies. Scientific tales can be political or philosophical. Scientific and sound or hollow metaphysical ideas are not independent of their archetypal backgrounds which inform and shape them in the minds of their authors. Even a psychological fancy is a self-consistent coherence – like a poem or work of art – perhaps a stopgap on the way to more rational thought. To love such a psychological fancy requires a certain suspension of logic, disbelief, and even confirmation bias. Metaphysical ideas are by definition ‘beyond physics’, but not separate from their roots in mind-dependent ideas and philosophy. Marie-Louise von Franz said, “There is therefore no concept fundamental to modern physics that is not in one degree or another a differentiated form of some primordial archetypal idea" ( Projection and Recollection in Jungian Psychology). 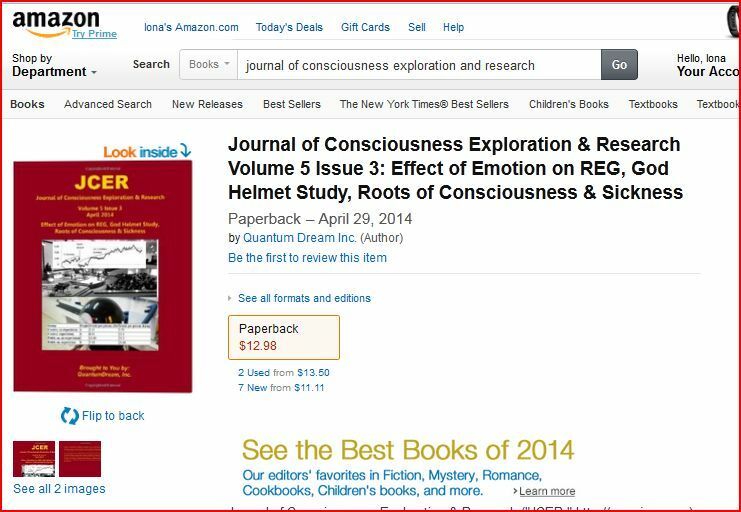 Ideas about mind and consciousness are currently firmly entrenched in this category. What has been undemonstrable in the past may not remain so in the future. Debriding the hidden forces of their archetypal projections remains a challenge at the leading edge. Essence, by its very nature, remains stubbornly intangible, unknown, and unseen. Form, on the other hand, requires only ingenuity, engineering, and due diligence. 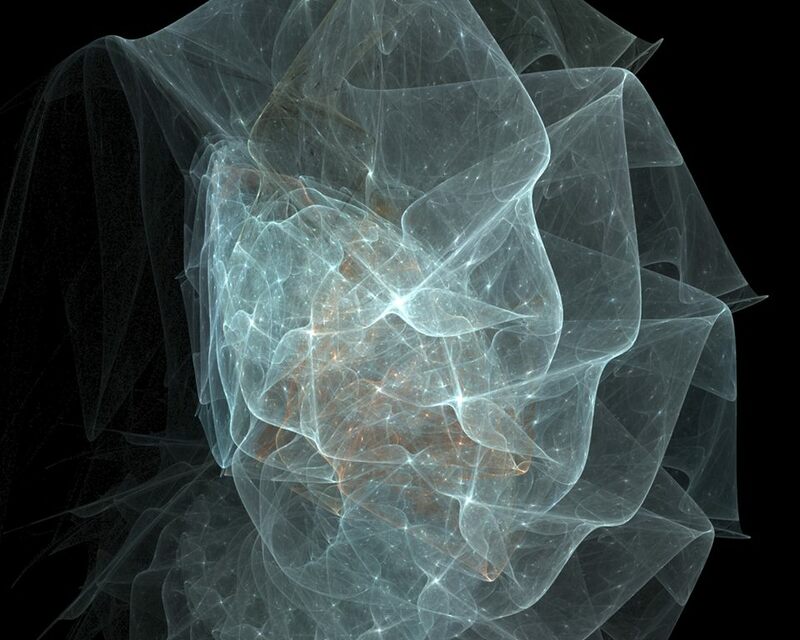 The concept of ‘quantum brain’ looks the part, but can it play the part? Is it coherent or incoherent? If it continues building traction, it might rewrite the metanarrative of physics -- the Holy Grail of paradigm shift -- much to the chagrin of the old guard. Is it rising from a subcategory of theory and experimentation – ideas about ideas -- toward fundamental laws? We can paint broad strokes with narratives, which must ultimately be backed by hard science of experimental results. Yet, sometimes even concrete evidence is not recognized, or imply ignored, still labeled as dubious, delusional, and flawed. Such is the case for recent experiments to detect spin-mediated consciousness. Evolving a master narrative involving consciousness studies, quantum brain, torsion fields, or zero point takes place in a largely academic conditioned environment. No matter what we call it, there is a fundamental difference from consciousness that informs matter, or mind that emerges from dynamic physical form. It spawns many essentially different ideas, despite their apparent kinship. Does conscious awareness naturally emerge from complex structure or does it arise a priori, emerging in a co-extensive way with matter? The former models quantum brain theory, while the later reflects the primordial nature of pre-spacetime. 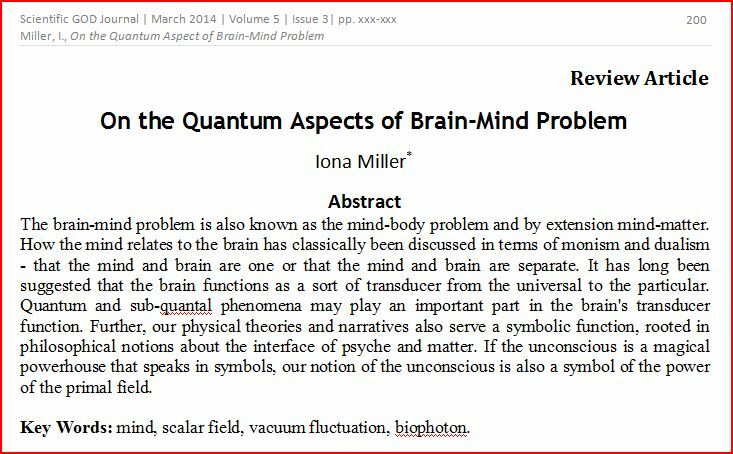 In neuroscience, quantum brain dynamics (QBD) is a hypothesis to explain the function of the brain within the framework of quantum field theory. 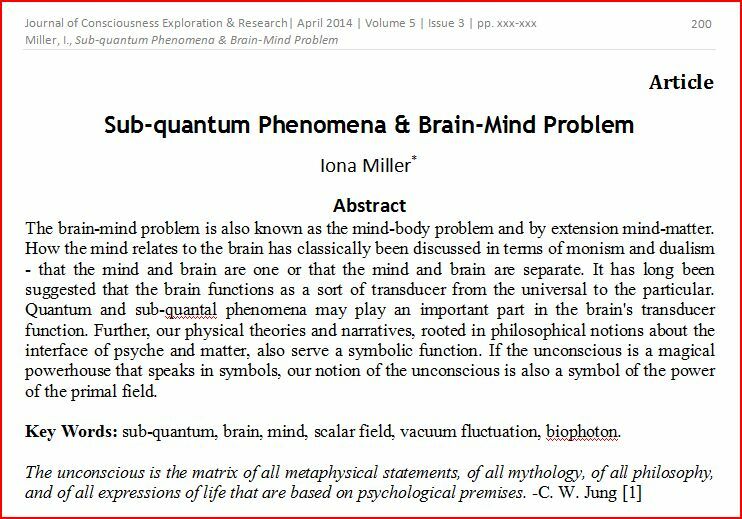 In The Quantum Brain (2002), Jeffrey Satinover reviews the convergence of brain science, biological computation and quantum physics, and what it implies about our minds, our selves, our future, even God. His is the world of neural nets, computing, cellular automata, genetic algorithms, artificial intelligence, neurobiology, artificial intelligence, and some basic philosophy of mind problems. He contends the brain amplifies quantum phenomena to produce free will. Some narratives come from more credible sources than others. This area has come a long way from its origins in “ether physics” but sentiments within conservative academic communities remain skeptical. Because it has been labeled a ‘forbidden topic’ in some arenas has not deterred its exploration within frontier science. The aspects which withstand scrutiny may be embraced, while those that do not are relegated to the dustbin of failed ideas. We're learning more and more about the pre-conscious nature of the medical and psychological unconscious, as well as the group mind of trends and -isms that go on beyond our normal background reality. How can we increase connectivity/coupling between the atom/molecule level reality and the vacuum level of reality? This is a question posed by Tiller, among others who propose theories. He suggests we delve beneath the pop buzzword of zero-point field to the enormity of latent energy in the vacuum reality beyond normal reality. He suggests we are are "emotional, mental, and spiritual", echoing qabalistic and theosophical notions, as well as other wisdom traditions. Others, including physicist Claude Swanson, Gary Schwartz, and Leon Maurer echo these sentiments that non-consciousness is co-extensive with Absolute Space. "Never Mind" becomes a euphemism for the one mind or (potential) proto-consciousness that seems to emanate from this timeless domain of absolute space. Researchers such as Swanson call such processes 'Life Force', and describe its dynamics in energetic terms of control and communication channels involving frequencies of radiation between DNA, molecules and cells. Mae-Wan Ho concurs. Coherent biophotons function in a laser-like manner to regulate mindbody coordination. Such work bears on notions of the nature of life and consciousness which have been persistently elusive in both biology and physics models. There is a continuous shift in the languaging of notions about consciousness, the mindfield, quantum brain, holographic mind, and negentropy. Words, concepts and theories map the footprints of our crystallizing intuition, but descriptors come into and fall out of fashion. The dialogical edge has dropped down another level to the pre-quantum world, to a principle underlying those of quantum mechanics. First discovered by Tesla, what were called scalar waves are now known by their Russian label as torsion waves. Their spiraling nature is simply an impulse of momentum that travels through the medium of the aether/ZPE/physical vacuum, without electromagnetic qualities. The all-pervasive sea of quantum energy, discovered in the 20th century, remains arguably the most exciting frontier of the 21st century, both in terms of pure science as well as energy extraction and engineering. The jiggling of subatomic particles is attributed to the zero point field, the virtual photon flux that occurs between the dipole and the vacuum. Virtual particles are not stable enough to remain in manifestation yet they have tangible effects -- a frictionless field of potentiality with spinning effects with emissions. Photons and the variety of elementary particles seemingly come into our physical reality from nowhere at all. They make their appearance in our physical reality for only thousandths or millionths of a second to disappear once again into the void. These forms of ‘mystical’ particles were called virtual particles since they were not stable enough to stay around in our reality. 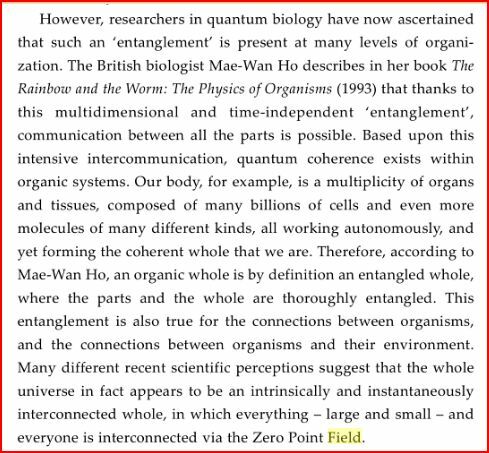 The zero point field is a quantum foam of virtual particles and photons. Such modeling may have implications for new computer brain language that allows computers to learn, and to read human thoughts by using brain-machine interface, and the ethical implications that raises. Our neural synapses will soon work as biochemical nano-devices to transfer information energy from electrical to biochemical signals. 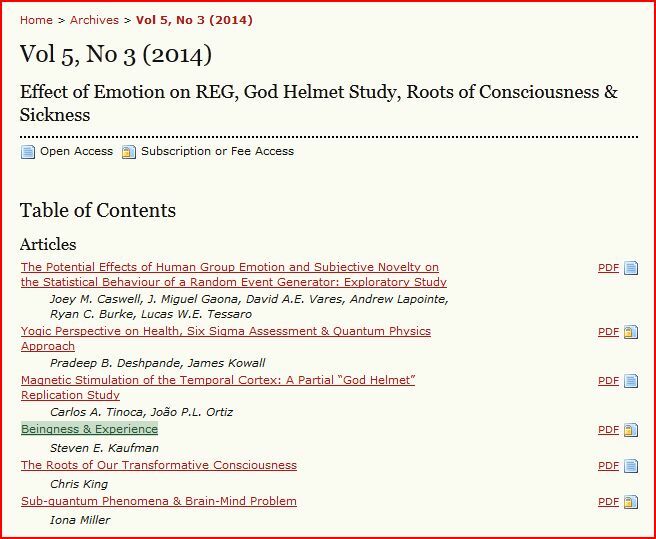 Engineering applications in zero-point energy extraction, torsion field generators, or antigravity are beyond the remit of this article, which focuses on the ontology and epistemology of the source field in relation to human energy systems. Separating legitimate theoretical ideas from pseudoscience requires stripping the theory down to bare bones and resisting wild speculations -- the imaginative from the purely fantastical. Shaking off the legacy of fanciful ether theory has not been easy in this research niche. Negentropy is the degree of order, or function of a state. 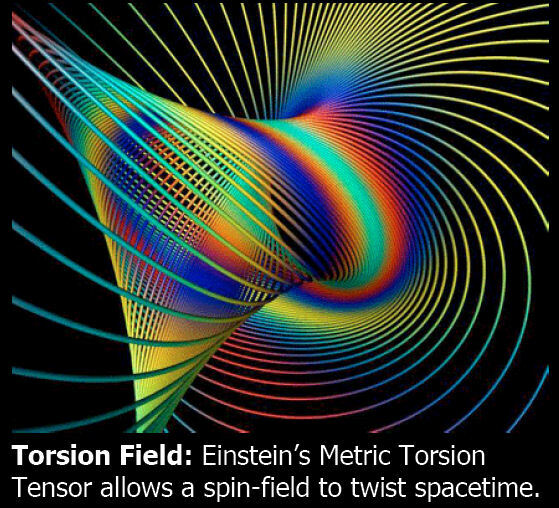 Torsion is different from these other three fields that could have spherical symmetry. 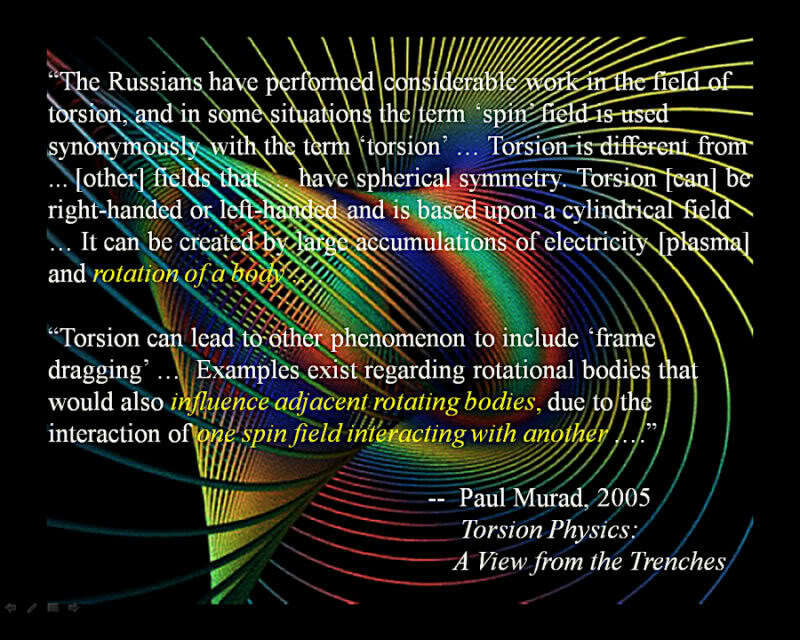 Torsion could be right-handed or left-handed and is based upon a cylindrical field and can be created by large accumulations of electricity and rotation of a body that if above a certain speed, would enhance the torsion field. Torsion can lead to other phenomenon including frame dragging. Tom Bearden described the fundamental torsion wave within the electromagnetic wave. This wave remains when two opposing electromagnetic fields interfere, cancelling out each other’s electrical and magnetic field components. The result is a longitudinal wave that vibrates in the same direction in which it travels. Kozyrev noticed that all physical objects can absorb as well as emit torsion waves. By shaking physical objects, vibrating and altering them, through heating or cooling, they generate measurable torsion waves. Even displacing an object generates a measurable torsion wave. Every movement, from the vibrations of an atom to the orbit time of our planets, leaves its mark on the ether in the form of torsion waves. SED: The stochastic electro-dynamics SED approach affirms that the ZPE exists as electromagnetic fields or waves whose effects explain the observed phenomena equally well. SED treats quantum field-particle interactions like classical dynamics (Puthoff, 1987). In the SED approach, the vacuum at the atomic or sub-atomic level may be considered inherently comprised of a turbulent sea of randomly fluctuating electro-magnetic fields or waves. Stochastic resonance is produced by random stimuli. This model is tied to string theory, but, have they actually found it? As we understand it, the amplituhedron is a geometric consequence of solving Yang-Mills in 4-D, in lieu of adding an increasingly chaotic amount of Feynman diagrams, due to superconformal invariance, but they haven't seen it. Therefore, it remains a model at this point – a version of twistors. They hope to find another shape similar but more profound that does answer all things (including gravity and time). Comings and Miller (2005) have proposed the void is a plenum in the Creative Physics model. The nature of embodiment is light. Another viable model of the Bivacuum comes from Kaivarainen. The quantum vacuum is a dynamic massless scalar field. A scalar is a vector characterized by magnitude and time. Scalar waves (virtual particle flux wave) in the virtual state massless charge flux do not breach the quantum level to become observable, yet they are real. They are harmonic oscillations of the stress energy tensor of the vacuum. They cross the threshold of manifestation only briefly before they vanish. In the vacuum state everything is disintegrated, but highly dynamic. The vacuum is not an emptiness filled with massless charge, rather, it IS identically massless charge (disintegrated dynamicism). Though no real particles are present, it is a plenum, not an emptiness. It is also pure, undifferentiated action. A curious thing has happened along the way to a Theory of Everything, which is that physics is taking a more and more mystical attitude in its descriptors of what remains essentially a great Mystery. This mystery is compounded when we attempt to apply physics theories to biological organisms, including ourselves – the realm of biophysics. Buckminster Fuller spoke in quasi-mystical tones rhapsodizing about his sublime geometries, which bear a suspicious resemblance to zero-point. Jitterbugging Vector Equilibrium Matrix is not structure but a system, the prime nucleated system. V.E. makes conceptual models of 4th, 5th and 5th dimensional omniexperience possible, using tetrahedroning. A current example of this is CDT theory, a triangular universe of 4-dimensional tetrahedrons. Equilibrium between + and is Zero. V.E. is the true zero reference of the energetic mathematics. It is cosmic zero.Zero pulsation in the V.E. is a metaphorm of eternity and God: the zero-phase of conceptual integrity inherent in the + and - asymmetries. V.E. is important because all the nuclear tendencies to implosion and explosion are reversible and always in exact balance. V.E. is the anywhere, anywhen, eternally regenerative, event inceptioning and evolutionary accomodation that is never seen in any experience. This metaphorm (V.E.) represents the self's initial real-I-zation both inwardly and outwardly from the beginning of being "betweenness"; maximum inbetweenness. Push/pull; convergence/divergence; gravity/radiation.At zero-point, waves pass through waves without interfering with one another. Vectoral phase or zone of neutral resonance occurs between outwardly pushing wave propagation and inwardly pulling gravitational coherence. Emptiness at the Center: all 4 planes of all 8 tetrahedra are congruent in the four visible planes passing through a common V.E. center, the cosmic terminal condition and nature's most economical lines of energy travel..The dynamic activity connected with the drive to know, to penetrate, to illumine, culminates in a stillness, silence, cessation of all effort which itself dissolves in the tranquility of total negation. 0 = 2. It is only by virtue of the fact that it is Naught. All form and power are latent in the Void. Haramein and Rauscher (2005) have employed this cuboctahdron to model all of creation. Astrophysicist, Nikolai Kozyrev wrote his dynamic vacuum theory – an aether theory -- in the 1950s. 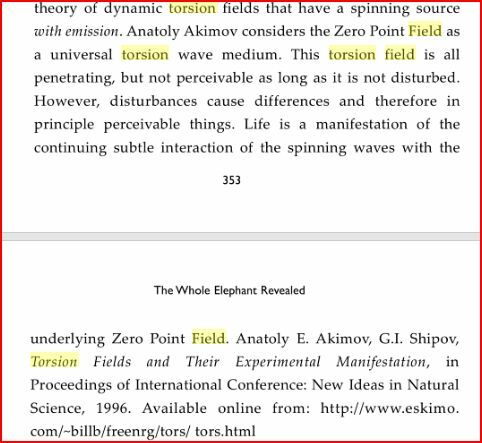 Kozyrev described spinning or twisting “torsion fields” and/or “torsion waves” as the spiraling flow of “time energy. Lt. Col. Tom Bearden, calls them “scalar waves.” Their spiraling nature is simply an impulse of momentum that travels through the medium of the aether/ZPE/physical vacuum, without electromagnetic qualities. Ho, Mae-Wan, What is (Schrödinger's) Negentropy? , Modern Trends in BioThermoKinetics 3, 50-61, 1994. T.M. Wu. In Bioelectromagnetism and Biocommunication (M.W. Ho, F.A. Popp and U. Warnke, eds.). World Scientific, Singapore (in press). E. Schrödinger What is Life? Cambridge University Press, Cambridge, 1944. L. Brillouin, L. Science and Information Theory, 2nd ed., Academic Press, New York, 1962. Penrose, O. Foundations of Statistic Mechanics, A Deductive Approach, Pergamon Press, Oxford, 1970. A. Szent-Györgi, A. An Introduction to Submolecular Biology, Academic Press, New York, 1960. F.A. Popp. In Disequilibrium and Self-Organization (C.W. Kilmister, ed. ), p.207, Reidel, Dordrecht, 1986. F.A. Popp, K.H. Li, and Q. Gu, eds. Recent Advances in Biophoton Research, World Scientific, Singapore, 1992. F.A. Popp and K.H. Li. In Recent Advances in Biophoton Research (F.A. Popp, K.H. Li and Q. Gu, eds. ), p. 47, World Scientific, Singapore, 1992. 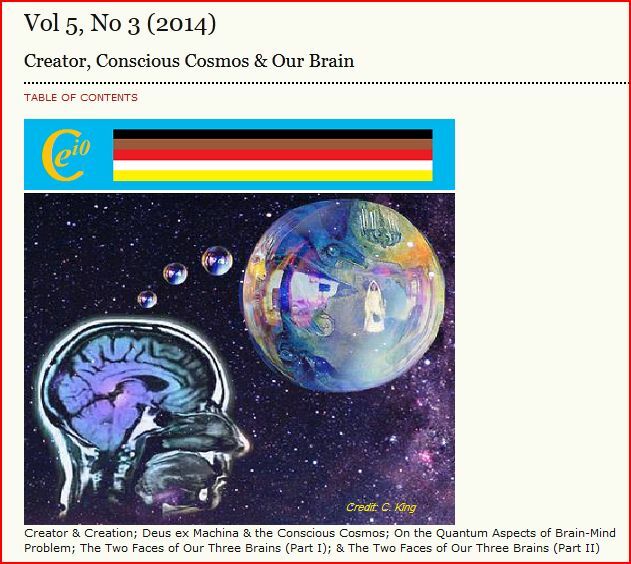 Hu and Wu - As an alternative to our original dualistic approach, we present here our spin-mediated consciousness theory based on pan-protopsychism. We postulate that consciousness is intrinsically connected to quantum mechanical spin since said spin is embedded in the microscopic structure of spacetime and may be more fundamental than spacetime itself. Thus, we theorize that consciousness emerges quantum mechanically from the collective dynamics of "protopsychic" spins under the influence of spacetime dynamics. That is, spin is the "pixel" of mind. The unity of mind is achieved by quantum entanglement of the mind-pixels. Applying these ideas to the particular structures and dynamics of the brain, we postulate that the human mind works as follows: The nuclear spin ensembles ("NSE") in both neural membranes and proteins quantum mechanically process consciousness-related information such that conscious experience emerges from the collapses of entangled quantum states of NSE under the influence of the underlying spacetime dynamics. Said information is communicated to NSE through strong spin-spin couplings by biologically available unpaired electronic spins such as those carried by rapidly diffusing oxygen molecules and neural transmitter nitric oxides that extract information from their diffusing pathways in the brain. In turn, the dynamics of NSE has effects through spin chemistry on the classical neural activities such as action potentials and receptor functions thus influencing the classical neural networks of said brain. We also present supporting evidence and make important predictions. We stress that our theory is experimentally verifiable with present technologies. Confirmation bias (also called confirmatory bias or myside bias) is the tendency of people to favor information that confirms their beliefs or hypotheses. [Note 1] People display this bias when they gather or remember information selectively, or when they interpret it in a biased way. The effect is stronger for emotionally charged issues and for deeply entrenched beliefs. They also tend to interpret ambiguous evidence as supporting their existing position. Biased search, interpretation and memory have been invoked to explain attitude polarization (when a disagreement becomes more extreme even though the different parties are exposed to the same evidence), belief perseverance (when beliefs persist after the evidence for them is shown to be false), the irrational primacy effect (a greater reliance on information encountered early in a series) and illusory correlation (when people falsely perceive an association between two events or situations). Biased search for information Confirmation bias has been described as an internal "yes man", echoing back a person's beliefs like Charles Dickens' character Uriah Heep. Experiments have found repeatedly that people tend to test hypotheses in a one-sided way, by searching for evidence consistent with their current hypothesis. Rather than searching through all the relevant evidence, they phrase questions to receive an affirmative answer that supports their hypothesis. They look for the consequences that they would expect if their hypothesis were true, rather than what would happen if it were false. For example, someone using yes/no questions to find a number he or she suspects to be the number 3 might ask, "Is it an odd number?" People prefer this type of question, called a "positive test", even when a negative test such as "Is it an even number?" would yield the exact same information. However, this does not mean that people seek tests that guarantee a positive answer. In studies where subjects could select either such pseudo-tests or genuinely diagnostic ones, they favored the genuinely diagnostic. Even a small change in a question's wording can affect how people search through available information, and hence the conclusions they reach. This was shown using a fictional child custody case. Participants read that Parent A was moderately suitable to be the guardian in multiple ways. Parent B had a mix of salient positive and negative qualities: a close relationship with the child but a job that would take him or her away for long periods of time. When asked, "Which parent should have custody of the child?" the majority of participants chose Parent B, looking mainly for positive attributes. However, when asked, "Which parent should be denied custody of the child?" they looked for negative attributes and the majority answered that Parent B should be denied custody, implying that Parent A should have custody. Personality traits influence and interact with biased search processes. Individuals vary in their abilities to defend their attitudes from external attacks in relation to selective exposure. Selective exposure occurs when individuals search for information that is consistent, rather than inconsistent, with their personal beliefs. An experiment examined the extent to which individuals could refute arguments that contradicted their personal beliefs. People with high confidence levels more readily seek out contradictory information to their personal position to form an argument. Individuals with low confidence levels do not seek out contradictory information and prefer information that supports their personal position. People generate and evaluate evidence in arguments that are biased towards their own beliefs and opinions. Heightened confidence levels decrease preference for information that supports individuals’ personal beliefs. Biased interpretation "Smart people believe weird things because they are skilled at defending beliefs they arrived at for non-smart reasons." --Michael Shermer Confirmation biases are not limited to the collection of evidence. Even if two individuals have the same information, the way they interpret it can be biased. The participants, whether supporters or opponents, reported shifting their attitudes slightly in the direction of the first study they read. Once they read the more detailed descriptions of the two studies, they almost all returned to their original belief regardless of the evidence provided, pointing to details that supported their viewpoint and disregarding anything contrary. Participants described studies supporting their pre-existing view as superior to those that contradicted it, in detailed and specific ways. Writing about a study that seemed to undermine the deterrence effect, a death penalty proponent wrote, "The research didn't cover a long enough period of time", while an opponent's comment on the same study said, "No strong evidence to contradict the researchers has been presented". The results illustrated that people set higher standards of evidence for hypotheses that go against their current expectations. This effect, known as "disconfirmation bias", has been supported by other experiments. An MRI scanner allowed researchers to examine how the human brain deals with unwelcome information. Another study of biased interpretation occurred during the 2004 US presidential election and involved participants who reported having strong feelings about the candidates. They were shown apparently contradictory pairs of statements, either from Republican candidate George W. Bush, Democratic candidate John Kerry or a politically neutral public figure. They were also given further statements that made the apparent contradiction seem reasonable. From these three pieces of information, they had to decide whether or not each individual's statements were inconsistent. There were strong differences in these evaluations, with participants much more likely to interpret statements from the candidate they opposed as contradictory. In this experiment, the participants made their judgments while in a magnetic resonance imaging (MRI) scanner which monitored their brain activity. As participants evaluated contradictory statements by their favored candidate, emotional centers of their brains were aroused. This did not happen with the statements by the other figures. The experimenters inferred that the different responses to the statements were not due to passive reasoning errors. Instead, the participants were actively reducing the cognitive dissonance induced by reading about their favored candidate's irrational or hypocritical behavior. Biases in belief interpretation are persistent, regardless of intelligence level. Participants in an experiment took the SAT test (a college admissions test used in the United States) to assess their intelligence levels. They then read information regarding safety concerns for vehicles, and the experimenters manipulated the national origin of the car. American participants provided their opinion if the car should be banned on a six point scale, where one indicated “definitely yes” and six indicated “definitely no.” Participants firstly evaluated if they would allow a dangerous German car on American streets and a dangerous American car on German streets. Participants believed that the dangerous German car on American streets should be banned more quickly than the dangerous American car on German streets. There was no difference among intelligence levels at the rate participants would ban a car. Biased memory Even if people gather and interpret evidence in a neutral manner, they may still remember it selectively to reinforce their expectations. This effect is called "selective recall", "confirmatory memory" or "access-biased memory". Psychological theories differ in their predictions about selective recall. Schema theory predicts that information matching prior expectations will be more easily stored and recalled than information that does not match. Some alternative approaches say that surprising information stands out and so is memorable. Predictions from both these theories have been confirmed in different experimental contexts, with no theory winning outright. In one study, participants read a profile of a woman which described a mix of introverted and extroverted behaviors. They later had to recall examples of her introversion and extroversion. One group was told this was to assess the woman for a job as a librarian, while a second group were told it was for a job in real estate sales. There was a significant difference between what these two groups recalled, with the "librarian" group recalling more examples of introversion and the "sales" groups recalling more extroverted behavior. A selective memory effect has also been shown in experiments that manipulate the desirability of personality types. In one of these, a group of participants were shown evidence that extroverted people are more successful than introverts. Another group were told the opposite. In a subsequent, apparently unrelated, study, they were asked to recall events from their lives in which they had been either introverted or extroverted. Each group of participants provided more memories connecting themselves with the more desirable personality type, and recalled those memories more quickly. Changes in emotional states can also influence memory recall. Participants rated how they felt when they had first learned that O.J. Simpson had been acquitted of murder charges. They described their emotional reactions and confidence regarding the verdict one week, two months, and one year after the trial. Results indicated that participants’ assessments for Simpson’s guilt changed over time. The more that participants’ opinion of the verdict had changed, the less stable were the participant’s memories regarding their initial emotional reactions. When participants recalled their initial emotional reactions two months and a year later, past appraisals closely resembled current appraisals of emotion. People demonstrate sizable myside bias when discussing their opinions on controversial topics. Memory recall and construction of experiences undergo revision in relation to corresponding emotional states. Related effects Polarization of opinion Main article: Attitude polarization When people with opposing views interpret new information in a biased way, their views can move even further apart. This is called "attitude polarization". The effect was demonstrated by an experiment that involved drawing a series of red and black balls from one of two concealed "bingo baskets". Participants knew that one basket contained 60% black and 40% red balls; the other, 40% black and 60% red. The experimenters looked at what happened when balls of alternating color were drawn in turn, a sequence that does not favor either basket. After each ball was drawn, participants in one group were asked to state out loud their judgments of the probability that the balls were being drawn from one or the other basket. These participants tended to grow more confident with each successive draw—whether they initially thought the basket with 60% black balls or the one with 60% red balls was the more likely source, their estimate of the probability increased. Another group of participants were asked to state probability estimates only at the end of a sequence of drawn balls, rather than after each ball. They did not show the polarization effect, suggesting that it does not necessarily occur when people simply hold opposing positions, but rather when they openly commit to them. Strong opinions on an issue such as gun ownership can bias how someone interprets new evidence. A less abstract study was the Stanford biased interpretation experiment in which participants with strong opinions about the death penalty read about mixed experimental evidence. Twenty-three percent of the participants reported that their views had become more extreme, and this self-reported shift correlated strongly with their initial attitudes. In later experiments, participants also reported their opinions becoming more extreme in response to ambiguous information. However, comparisons of their attitudes before and after the new evidence showed no significant change, suggesting that the self-reported changes might not be real. Based on these experiments, Deanna Kuhn and Joseph Lao concluded that polarization is a real phenomenon but far from inevitable, only happening in a small minority of cases. They found that it was prompted not only by considering mixed evidence, but by merely thinking about the topic. Charles Taber and Milton Lodge argued that the Stanford team's result had been hard to replicate because the arguments used in later experiments were too abstract or confusing to evoke an emotional response. The Taber and Lodge study used the emotionally charged topics of gun control and affirmative action. They measured the attitudes of their participants towards these issues before and after reading arguments on each side of the debate. Two groups of participants showed attitude polarization: those with strong prior opinions and those who were politically knowledgeable. In part of this study, participants chose which information sources to read, from a list prepared by the experimenters. For example they could read the National Rifle Association's and the Brady Anti-Handgun Coalition's arguments on gun control. Even when instructed to be even-handed, participants were more likely to read arguments that supported their existing attitudes than arguments that did not. This biased search for information correlated well with the polarization effect. The "backfire effect" is a name for the finding that, given evidence against their beliefs, people can reject the evidence and believe even more strongly. The phrase was first coined by Brendan Nyhan and Jason Reifler. Persistence of discredited beliefs "[B]eliefs can survive potent logical or empirical challenges. They can survive and even be bolstered by evidence that most uncommitted observers would agree logically demands some weakening of such beliefs. They can even survive the total destruction of their original evidential bases." —Lee Ross and Craig Anderson Confirmation biases can be used to explain why some beliefs persist when the initial evidence for them is removed. This belief perseverance effect has been shown by a series of experiments using what is called the "debriefing paradigm": participants read fake evidence for a hypothesis, their attitude change is measured, then the fakery is exposed in detail. Their attitudes are then measured once more to see if their belief returns to its previous level. A common finding is that at least some of the initial belief remains even after a full debrief. In one experiment, participants had to distinguish between real and fake suicide notes. The feedback was random: some were told they had done well while others were told they had performed badly. Even after being fully debriefed, participants were still influenced by the feedback. They still thought they were better or worse than average at that kind of task, depending on what they had initially been told. Preference for early information Experiments have shown that information is weighted more strongly when it appears early in a series, even when the order is unimportant. For example, people form a more positive impression of someone described as "intelligent, industrious, impulsive, critical, stubborn, envious" than when they are given the same words in reverse order. This irrational primacy effect is independent of the primacy effect in memory in which the earlier items in a series leave a stronger memory trace. Biased interpretation offers an explanation for this effect: seeing the initial evidence, people form a working hypothesis that affects how they interpret the rest of the information. One demonstration of irrational primacy used colored chips supposedly drawn from two urns. Participants were told the color distributions of the urns, and had to estimate the probability of a chip being drawn from one of them. In fact, the colors appeared in a pre-arranged order. The first thirty draws favored one urn and the next thirty favored the other. The series as a whole was neutral, so rationally, the two urns were equally likely. However, after sixty draws, participants favored the urn suggested by the initial thirty. Illusory association between events Main article: Illusory correlation Illusory correlation is the tendency to see non-existent correlations in a set of data. This tendency was first demonstrated in a series of experiments in the late 1960s. In one experiment, participants read a set of psychiatric case studies, including responses to the Rorschach inkblot test. They reported that the homosexual men in the set were more likely to report seeing buttocks, anuses or sexually ambiguous figures in the inkblots. In fact the case studies were fictional and, in one version of the experiment, had been constructed so that the homosexual men were less likely to report this imagery. In a survey, a group of experienced psychoanalysts reported the same set of illusory associations with homosexuality. Example Days Rain No rain Arthritis 14 6 No arthritis 7 2 In the above fictional example, arthritic symptoms are more likely on days with no rain. However, people are likely to focus on the relatively large number of days which have both rain and symptoms. By concentrating on one cell of the table rather than all four, people can misperceive the relationship, in this case associating rain with arthritic symptoms. Individual differences Until recently,[when?] myside bias was once believed to be associated with greater intelligence; however, studies have shown that myside bias can be more influenced by ability to rationally think as oppose to amount of intelligence. Myside bias can cause an inability to effectively and logically evaluate the opposite side of an argument. Studies have stated that myside bias is an absence of “active open-mindedness,” meaning the active search for why an initial idea may by wrong. Typically, myside bias is operationalized in empirical studies as the quantity of evidence used in support of their side in comparison to the opposite side. A study has found individual differences in myside bias. This study investigates individual differences that are acquired through learning in a cultural context and are mutable. The researcher found important individual difference in argumentation. Studies have suggested that individual differences such as deductive reasoning ability, ability to overcome belief bias, epistemological understanding, and thinking disposition are a significant predictors of the reasoning and generating arguments, counterarguments, and rebuttals. A study by Christopher Wolfe and Anne Britt also investigated how participants' views of “what makes a good argument?” can be a source of myside bias that influence the way a person creates their own arguments. The study investigated individual differences of argumentation schema and asked participants to write essays. The participants were randomly assigned to write essays either for or against their side of the argument they preferred and given balanced or unrestricted research instructions. The balanced research instructions instructed participants to create a balanced argument that included both pros and cons and the unrestricted research instruction did not give any particular instructions on how to create the argument. Overall, the results revealed that balance research instruction significantly increased the use of participants adding opposing information to their argument. These data also reveal that personal belief is not a source of myside bias. Furthermore, participants who believed that good arguments were based on facts were more likely to exhibit myside bias than participants who did not agree with this statement. This evidence is consistent with the claims proposed in Baron's article that people's opinions about good thinking can influence how arguments are generated. Wason's research on hypothesis-testing The term "confirmation bias" was coined by English psychologist Peter Wason. For an experiment published in 1960, he challenged participants to identify a rule applying to triples of numbers. At the outset, they were told that (2,4,6) fits the rule. Participants could generate their own triples and the experimenter told them whether or not each triple conformed to the rule. While the actual rule was simply "any ascending sequence", the participants had a great deal of difficulty in finding it, often announcing rules that were far more specific, such as "the middle number is the average of the first and last". The participants seemed to test only positive examples—triples that obeyed their hypothesized rule. For example, if they thought the rule was, "Each number is two greater than its predecessor", they would offer a triple that fit this rule, such as (11,13,15) rather than a triple that violates it, such as (11,12,19). Klayman and Ha's critique A 1987 paper by Joshua Klayman and Young-Won Ha argued that the Wason experiments had not actually demonstrated a bias towards confirmation. Instead, Klayman and Ha interpreted the results in terms of a tendency to make tests that are consistent with the working hypothesis. They called this the "positive test strategy". This strategy is an example of a heuristic: a reasoning shortcut that is imperfect but easy to compute. Klayman and Ha used Bayesian probability and information theory as their standard of hypothesis-testing, rather than the falsificationism used by Wason. According to these ideas, each answer to a question yields a different amount of information, which depends on the person's prior beliefs. Thus a scientific test of a hypothesis is one that is expected to produce the most information. Since the information content depends on initial probabilities, a positive test can either be highly informative or uninformative. Klayman and Ha argued that when people think about realistic problems, they are looking for a specific answer with a small initial probability. In this case, positive tests are usually more informative than negative tests. However, in Wason's rule discovery task the answer—three numbers in ascending order—is very broad, so positive tests are unlikely to yield informative answers. Klayman and Ha supported their analysis by citing an experiment that used the labels "DAX" and "MED" in place of "fits the rule" and "doesn't fit the rule". This avoided implying that the aim was to find a low-probability rule. Participants had much more success with this version of the experiment. If the true rule (T) encompasses the current hypothesis (H), then positive tests (examining an H to see if it is T) will not show that the hypothesis is false. If the true rule (T) overlaps the current hypothesis (H), then either a negative test or a positive test can potentially falsify H. When the working hypothesis (H) includes the true rule (T) then positive tests are the only way to falsify H. In light of this and other critiques, the focus of research moved away from confirmation versus falsification to examine whether people test hypotheses in an informative way, or an uninformative but positive way. The search for "true" confirmation bias led psychologists to look at a wider range of effects in how people process information. Explanations Confirmation bias is often described as a result of automatic, unintentional strategies rather than deliberate deception. According to Robert Maccoun, most biased evidence processing occurs through a combination of both "cold" (cognitive) and "hot" (motivated) mechanisms. Cognitive explanations for confirmation bias are based on limitations in people's ability to handle complex tasks, and the shortcuts, called heuristics, that they use. For example, people may judge the reliability of evidence by using the availability heuristic, i.e. how readily a particular idea comes to mind. It is also possible that people can only focus on one thought at a time, so find it difficult to test alternative hypotheses in parallel. Another heuristic is the positive test strategy identified by Klayman and Ha, in which people test a hypothesis by examining cases where they expect a property or event to occur. This heuristic avoids the difficult or impossible task of working out how diagnostic each possible question will be. However, it is not universally reliable, so people can overlook challenges to their existing beliefs.